The Lost World: let's read it together! The Lost World Read 2009 celebrates the 150th anniversary of the birth of Sir Arthur Conan Doyle and the bicentenary of the birth of Charles Darwin with a mass-read of the classic adventure story The Lost World. It is part of Darwin 200 – the worldwide celebrations of the life and work of the man who transformed the world with his theory of evolution by natural selection. The Lost World Read 2009 brings communities together in England and Scotland to share the joy of reading, learn about the past, discuss issues of current concern and have fun. Go to Locations for details of the areas taking part. Thousands of copies of the full-text version of The Lost World and a specially commissioned adaptation for younger or less confident readers are being distributed across the participating sites, along with a graphic-style biography of Darwin. Go to Books for details of availability. Special events linked to the project are taking place, including reading group discussions, talks, exhibitions, walks and creative workshops. Go to What's On for details of what's happening in your area. Coverage of what's taken place already can be found on the News and Press page. The Children page highlights the involvement of young people. On this website there is information about The Lost World, Biographies of Conan Doyle and Darwin, and details of Resources where you can find out more. Support material for the project also includes an illustrated guide providing historical background information of relevance to the novel. Go to Downloads for PDF and Word versions of the guide. We are keen to receive feedback from readers on what they think of the book, the project and the issues raised, and will post a selection of the contributions we receive on the Comments page. To be kept updated about the Lost World Read 2009 and other reading and literature projects run by the partners, go to Registration to join the mailing list. 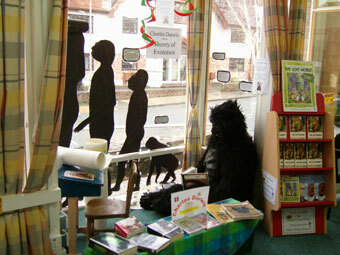 A Lost World Read display at Minehead Library, Somerset. You may want to postpone visiting some of the pages on this website until you have read the book in case you see something that will give the plot away. As the Lost World Read project has now officially ended we have closed the online survey and are no longer updating the website. You can read a summary of the comments received in this survey report. Ian Rankin supporting the campaign at the press launch in Edinburgh. 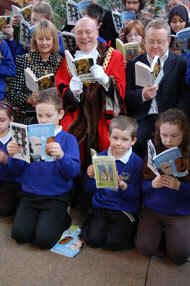 Reading at Bristol Zoo Gardens on launch day. 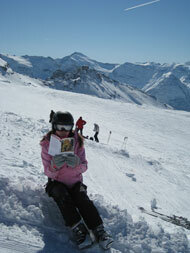 Rebecca reads The Lost World at 3450 metres in Val d'Isere.